How is it that the dog, alone among Earth’s species, comes in so many shapes and sizes? One way to get a feel for just how diverse dogs have become is to jam your fingers down the throat of a Great Dane and then, minutes later, a Chihuahua. This is what I found myself doing at age 16 during my first full-time summer job. A large kennel near my home boarded about 100 dogs, and soon after I started working there I discovered that not only was mine to be the hand that fed and cleaned up after them, but was also to be the one to administer pills to those on medication. Though my thoughts at the time largely ran to girls and sports, I do remember thinking how amazing it was that the Dr. Seussian mÃ©lange of creatures in my care all belonged to the same species. If had I stopped to wonder why they and Canis familiaris as a whole came in so many flavors, I probably would have told myself because we’ve been breeding them for those flavors for thousands of years. Dogs are diverse largely because of artificial rather than natural selection, because of us rather than nature. But just how much of their variety can be laid at our feet versus Mother Nature’s remains unclear. Charles Darwin suggested that one reason dogs are so variable is that they must have arisen not just from wolves but from other canids like jackals and coyotes as well. But recent genetic studies conducted by evolutionary biologist Robert Wayne and colleagues at the University of California at Los Angeles revealed that the mitochondrial DNA of dogs and wolves is very similar, while that of jackals and coyotes is distinctly different. 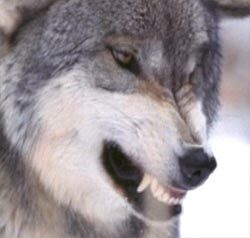 Astounding as it seems, all 400 or so recognized breeds today descend directly from the wolf. 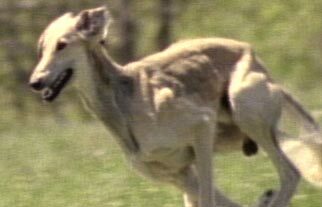 For the next few thousand years, right up until the late 19th century, people bred dogs for certain skills: running down prey (greyhounds), hunting rodents in holes (terriers), flushing and fetching game (pointers and retrievers). It wasn’t until the late 1800s, when kennel clubs first formed, that breeding for appearance rather than behavior began in earnest. Pure-breeding started then as well: To be registered as a purebred giant schnauzer, both your parents had to be registered as giant schnauzers. Breeders bent on designing the perfect breed are indubitably the reason why today we have dogs as divergent as the long-faced borzoi and squashed-faced bulldog, the Mexican hairless and lavishly hirsute Pekingese, the 150-pound St. Bernard and two-pound Chihuahua. Breeders have engineered an assortment of canines worthy of the creative powers of Maurice Sendak. But what accounts for breeders’ runaway success? 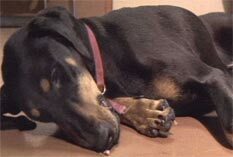 How, for example, could Louis Doberman, a German dog-pound keeper active in the late 1800s, take German pinschers, Rottweilers, Manchester terriers, and possibly pointers and, in just 35 years, create the Doberman pinscher? Such rapid change would seem to fly in the face of the Darwinian transmutation of species, a process typically thought to operate over thousands or even millions of years. Part of the reason lies in what happens when you cross two breeds. “Whenever you hybridize, instead of getting an average between the two types, you quite often get something that I call ‘phylogenetically bizarre,'” Coppinger says. “Which means you’ve never seen that form before in evolutionary terms.” Breeders build on those novel traits, winding up with the stubby legs of the dachshund or the rumpled-rug features of the shar-pei. Another part of the reason is that dogs’ bodies, particularly their skulls, undergo a major transformation between newborn and adult. (The skulls of newborn cats, by contrast, are already of adult proportion, which, along with less zealous breeding, may be one reason why the domestic cat is not nearly as motley as its household nemesis.) These physical changes are wrought by genes turning on and off at different times. By toying with the timing of nasal growth and other stages of development, breeders have engineered an assortment of canines worthy of the creative powers of Maurice Sendak. But what is it about dogs that makes them so plastic, so genetically malleable? “I don’t know of anyone who can answer that question,” Serpell told me straightforwardly. When I asked Stephen Budiansky, author of The Truth About Dogs, he said “it may be just one of those things like why do elephants have trunks and others don’t? It may just be almost an accident of evolution that dogs are so plastic while cats aren’t.” For his part, Budiansky feels we’ll know a lot more once researchers start thoroughly teasing apart the dog genome. Dogs are a supremely successful species. There are perhaps 50 million owned dogs in the United States alone, and many millions more running free. (Wolves, by contrast, probably number less than 150,000 worldwide.) But their companionship with man now comes at a cost. Their very mutability has resulted in certain breeds having been pushed to the edge of survivability—try breeding bulldogs with even shorter faces, and the resulting puppies may not be able to breathe. Inbreeding has also resulted in increased susceptibility of many purebred dogs to diseases and other medical ills. Love sponges-that’s what those kennel dogs I cared for so many years ago were. All except the one that bit me. 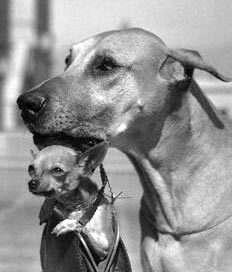 Bred that way or not, that Chihuahua had a chip on its shoulder.